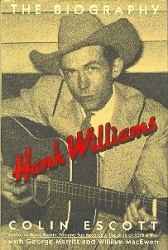 Discover the genius of one of the founding fathers of Country music Hank Williams, with Colin Escott's exceptional biography. Williams, 1923 - 1953, had a brief but amazing career, with numerous hit singles, including "Hey Good Lookin,'" but was plagued by substance abuse and alcoholism, which lead to his death at only 29. Essential reading on one of the most significant figures in 20th century music. Little Brown and Co. paperback, 1995.